The call came during the First Sharjah Child and Youth Friendly Carnival, coinciding with Universal Children’s Day and celebrating Sharjah’s recent accolade of being named a UNICEF Child-Friendly City. 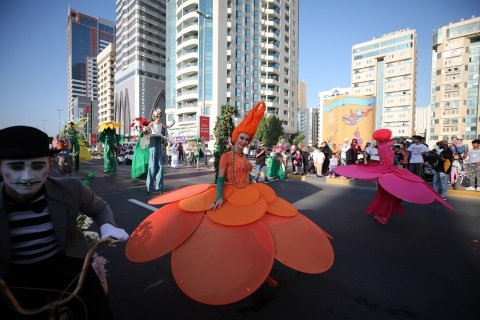 The carnival saw Sharjah’s streets come alive to the sound of music as street performers and 500-plus families, children, and representatives from government organizations took part in a festive 1-km procession along Al Buhaira Corniche Road, located in the heart of the emirate. The parade was led by the UAE Military Music Band who treated the crowds to a rousing performance on the bagpipes. Next up was ‘The Flying Dreams’ and its larger-than-life inflatable creations, including a giant bird and cartoon-style houses that soared high in the sky. The Bubbles Truck saw colourful bubble-dressed performers turn the city into a giant bubble-filled party, whereas the ‘Magic Garden’ was – quite literally – wild, with stilt walkers dressed as colorful flowers and plants. Held under the patronage of His Highness Sheikh Dr Sultan bin Muhammad Al Qasimi, Member of the UAE Supreme Council and Ruler of Sharjah, and organized by the Sharjah Baby Friendly Office. The Carnival culminated with a spectacular firework extravaganza; the perfect end to a delightful celebration paying tribute to the city’s future bright stars. SBFO aims to protect and elevate the status and wellbeing of children of all ages in Sharjah, by creating strategies and plans and implementing them in cooperation with relevant institutions and government authorities. The office is currently tasked with the implementation of the Sharjah Baby-Friendly Emirate Project (targeting 0-2 year-olds), and the Sharjah Child Friendly City Project (targeting 0-18 year-olds).